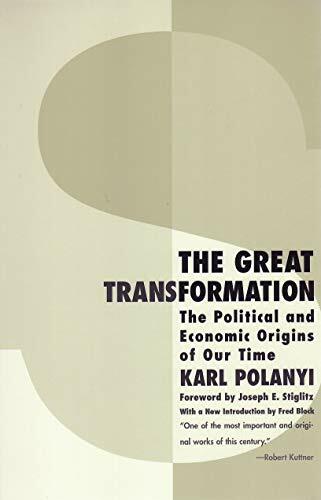 Amazon.com description: Product Description: In this classic work of economic history and social theory, Karl Polanyi analyzes the economic and social changes brought about by the "great transformation" of the Industrial Revolution. His analysis explains not only the deficiencies of the self-regulating market, but the potentially dire social consequences of untempered market capitalism. New introductory material reveals the renewed importance of Polanyi's seminal analysis in an era of globalization and free trade. About: One of the twentieth century's most thorough and discerning historians, Karl Polanyi sheds "new illumination on . About: In this classic work of economic history and social theory, Karl Polanyi analyzes the economic and social changes brought about by the "great transformation" of the Industrial Revolution.